Breakout Shipping allows the customer to select multiple shipping rates when an order ships from two or more warehouses. The items group by Shipping Classification Code, and a different shipping option is chosen for each (Note: this will not work when shipping options are displayed using radio buttons). A simple use case example would be an online furniture store that ships rugs from a warehouse in Oklahoma and ships beds from a warehouse in Texas. The Oklahoma Warehouse only Ships UPS, and the Texas warehouse only ships FedEx. If a customer adds both a bed and a rug to their cart, they'll need to be able to select both a FedEx service and a UPS service in order for shipping costs to calculate accurately. Breakout shipping makes this possible. All of the rugs would be assigned one classification code (For example: OK Warehouse), and all of the beds would be assigned a separate classification code (for example: TX Warehouse). Check Break out Shipping, and enter a Classification Code of your choosing. The classification code can be almost anything, but a common setup is to name the classification code after the warehouse or drop shipper. Products with the same shipping classification code will use the same shipping method(s) on the shopping cart and/or checkout page. At the beginning of this article, we used the example of an online furniture store that ships rugs from a warehouse in Oklahoma and ships beds from a warehouse in Texas. The Oklahoma Warehouse only Ships UPS, and the Texas warehouse only ships FedEx. To set this up, the furniture store needs to disable FedEx on all rugs, and disable UPS on all beds. 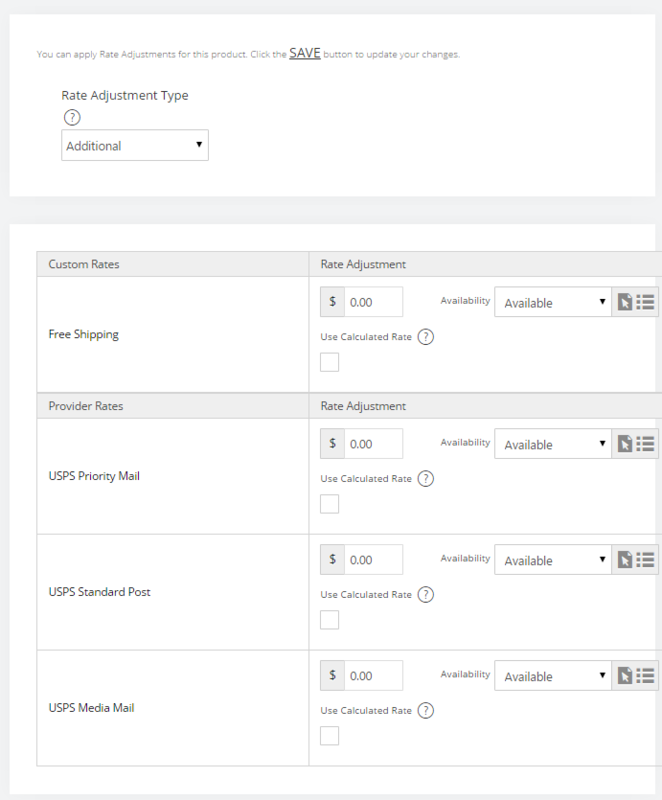 If your business requires a similar setup, you'll need to disable/enable shipping options on specific products using Rate Adjustments. 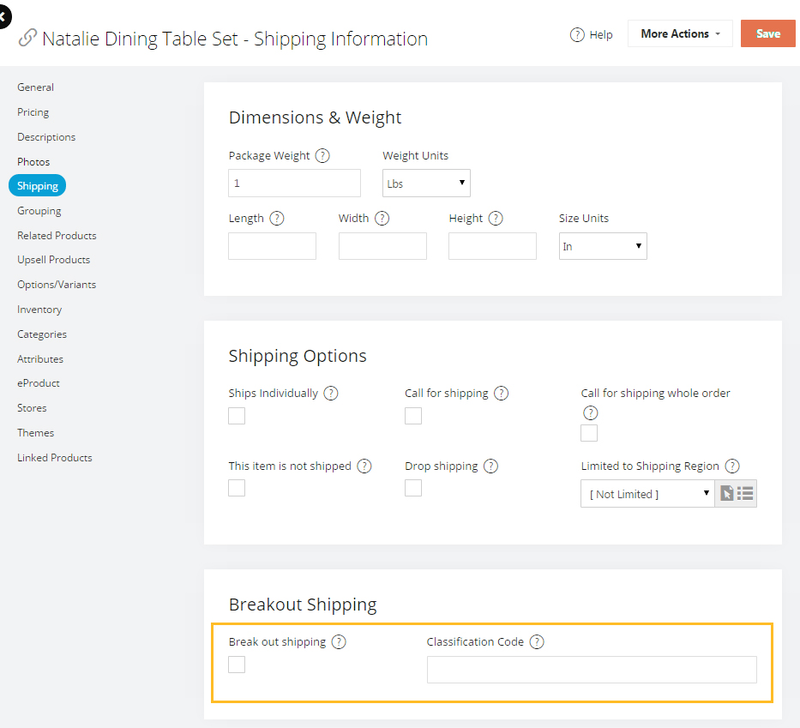 To enable or disable shipping options on a specific product, navigate to Catalog > Products > Edit Product > Shipping, and change Rate Adjustment Type to Additional, then click Save. If you have thousands of products or need to change the shipping availability en masse, you can use the Product Import Feature to edit the rate adjustment of many products at once.